Today was a big day for the Dolphin Swim Club because we made it to one of the most influential and wide-read magazines worldwide. 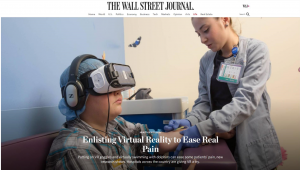 We are delighted to share this article, published in The Wall Street Journal, on the exciting possibilities of Virtual Reality within healthcare. The article mentioned our Virtual Reality experience of swimming with wild dolphins. Readers were offered a short VR-demo as well as a video of a young patient experiencing dolphin magic to help ease the pain. We are so proud that the readers of The Wall Street Journal had the opportunity to meet our wild dolphins!